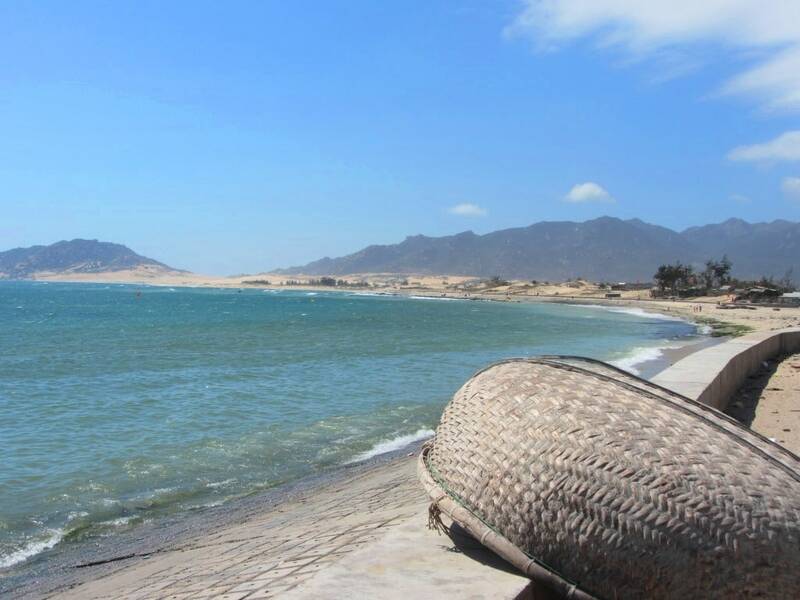 A sandy, boulder-strewn bluff separates the beach town of Phan Rang and the fishing village of Ca Na, on Vietnam’s south-central coast. Hiding wild, windy and isolated beaches, the landscape here is striking, arid and deserted: People say this is where dragons came to die, and the earth scorched itself in grief. 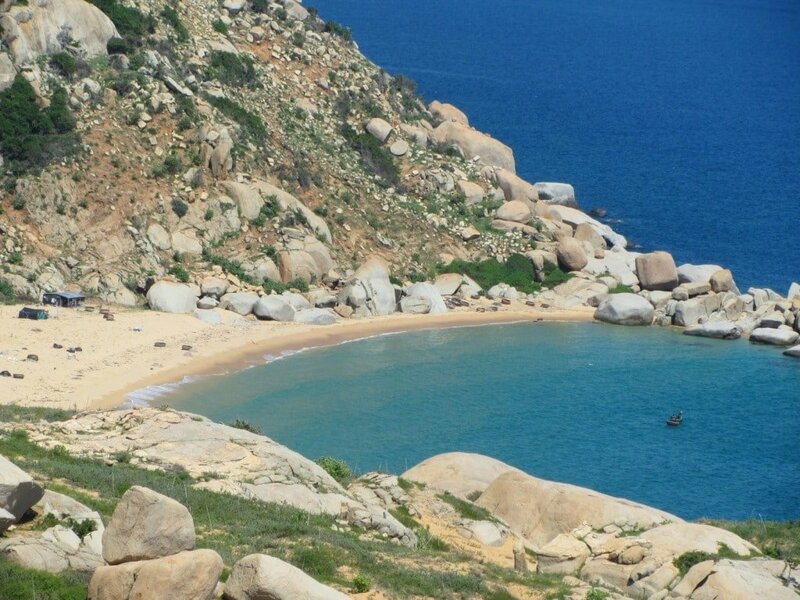 A stunning new coast road now connects Phan Rang and Ca Na, at once cutting out a boring section of Highway 1 and opening access to a tremendous, and previously inaccessable, section of coastline. The riding is easy and the scenery is superb. 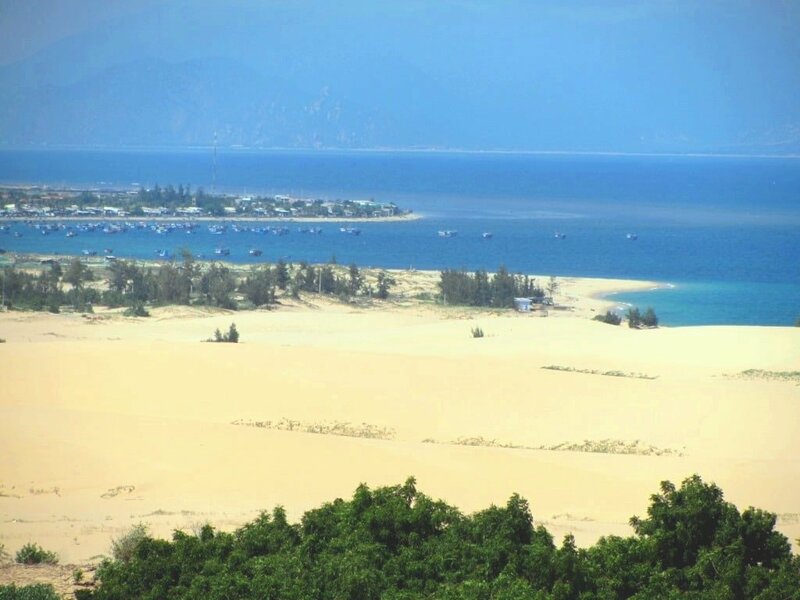 This new coast road links seamlessly with the Sand Dune Highway to the south and the Nui Chua Coast Road to the north, thus creating an uninterrupted coastal route between Mui Ne and Nha Trang, avoiding Highway 1 for all but 20km. 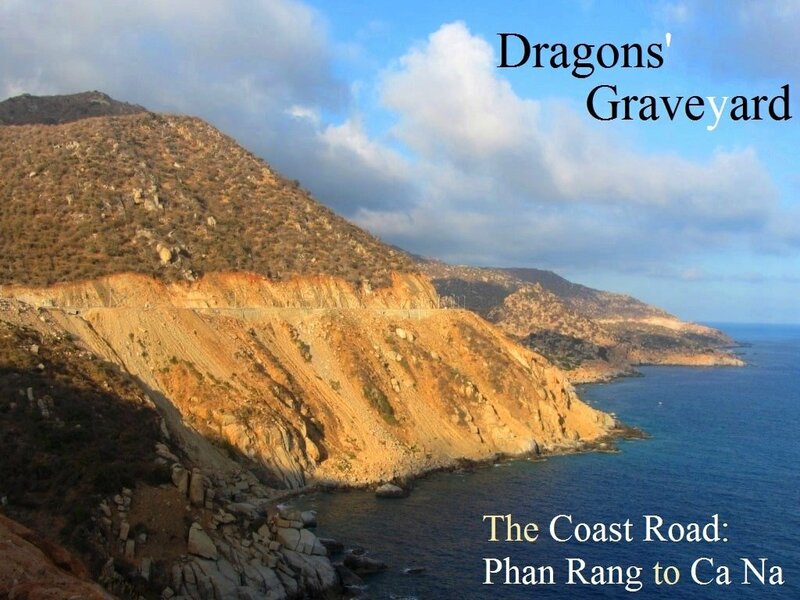 On this page, I’ve written a description of the Dragon’s Graveyard Coast Road from Phan Rang to Ca Na, including directions, a route map, and suggestions of places to stay and eat, and things to see and do along the way. 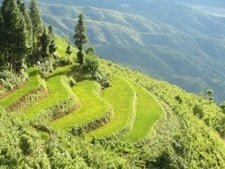 I’ve written this guide going from north to south (from Phan Rang to Ca Na), but obviously you can ride it in either direction. The total distance is only 50km (or 100km return) so it’s easy to complete this road trip in one day. 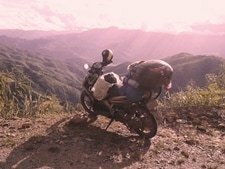 You should be able to find motorbikes to rent for the day from your accommodation in Phan Rang or Ca Na. 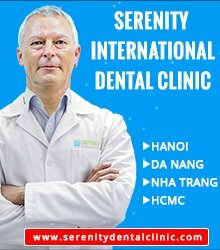 However, as I mentioned in the introduction, it’s a good idea to extend this road trip via the Sand Dune Highway to the south (Ca Na to Mui Ne) or the Nui Chua Coast Road to the north (Phan Rang to Nha Trang). The weather is good pretty much year-round as this is one of the driest regions in the country. However, to see the Dragon’s Graveyard at its arid, burnt-out best, go during the height of the dry season (January to March). 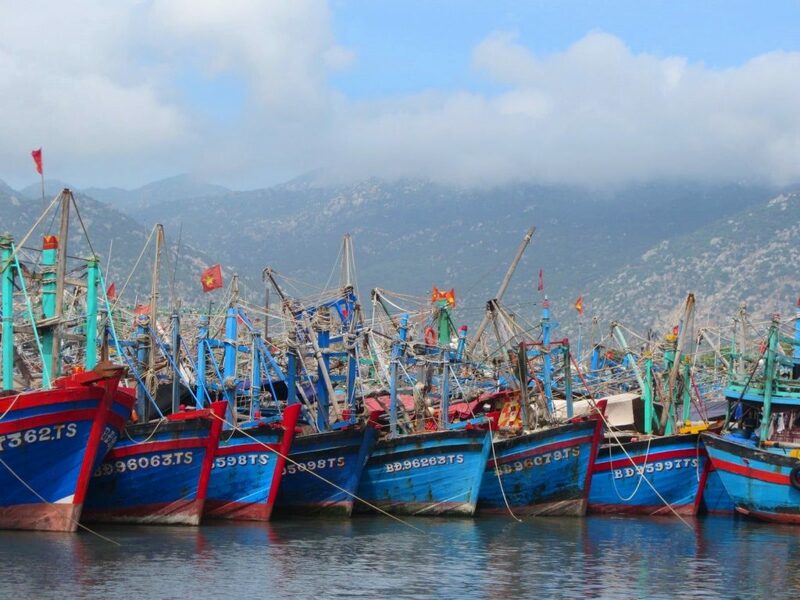 Phan Rang’s long, arcing beach is known as Ninh Chu Bay, and there are plenty of places to stay on either side of Yen Ninh beach road. If you’re on a mid-range budget try the beachside bungalows dotted among shady gardens at TTC Resort (formerly Bau Truc Resort). 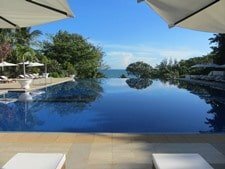 If you’re looking for cheaper digs, try the hotels and guesthouses on the non-beach side of the road or at the northern end of the bay (Minh Duc Guest House and Huong Bien Hotel are good options) or camp on the beach at the excellent Ninh Chu Bay Beach Club. In the evenings, street food vendors set up stalls on sections of Yen Ninh Street. Two of Phan Rang’s favourite dishes are bánh xèo and bánh căn, both of which are small, rice flour pancakes with savoury fillings cooked over an open flame. After dinner, try the King Beer Club for a drink by the ocean. 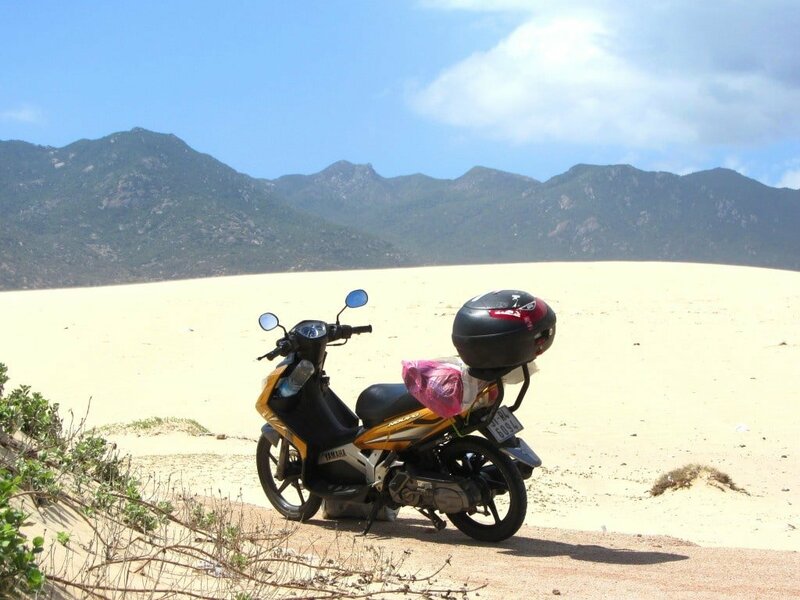 A night or two in Phan Rang is very pleasant, but the arid headland, visible in the distance, is just waiting to be explored on two wheels. A night or two on Ninh Chu beach, near Phan Rang, is very relaxing but this is only the start…. 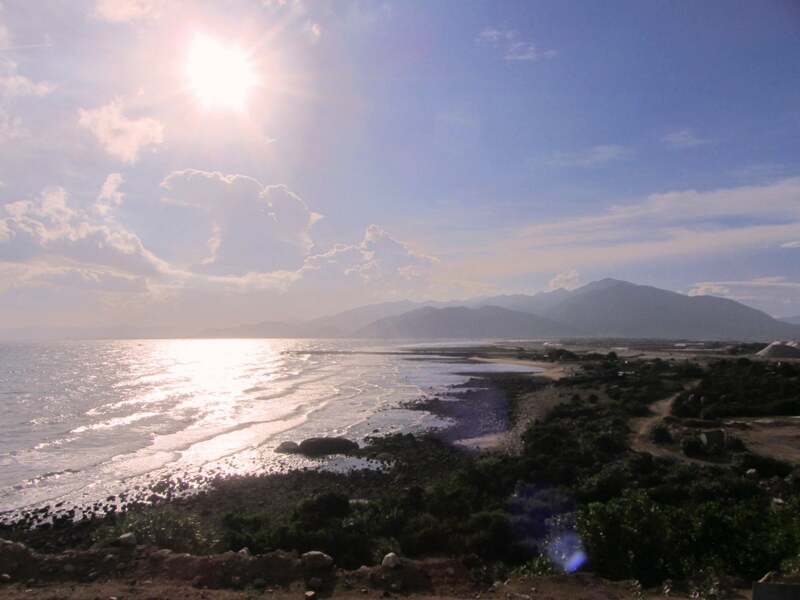 Take Yen Ninh beach road south out of Phan Rang until it crosses a new bridge over the Cai River. Not long after crossing the bridge the scenery begins to look like desert, and the road turns into a new, four-lane highway with absolutely no traffic on it. Big shrimp farms line the ocean-side of the road, while sand dunes and rock-piles rise on the inland side. The wide, empty highway through this desolate landscape is a surreal sight. 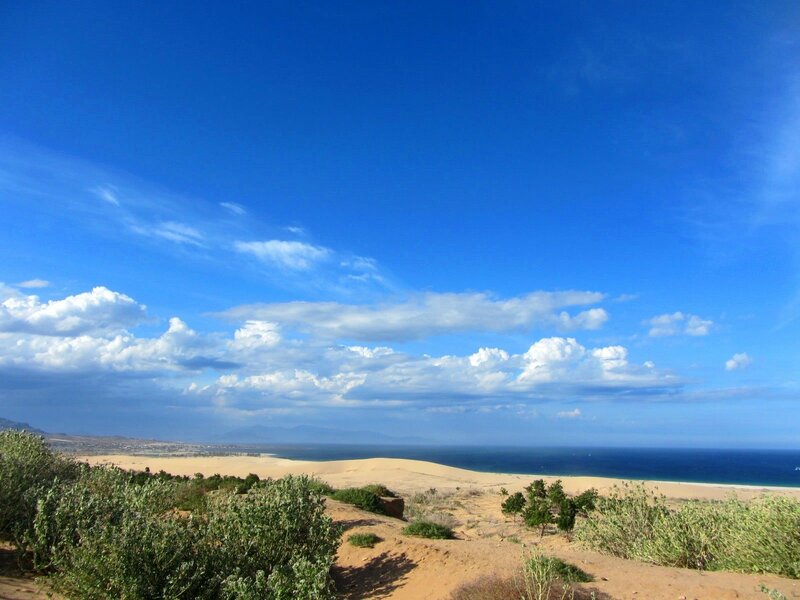 The landscape here is characterized by sand, cacti, boulders, arid mountains, and blue seas. Even before I started exploring this area, I always got the feeling, whenever I passed through its rocky, burned landscape, that there was something magical about it. The intense heat and the bright light reflecting off the boulders, sand and sea give the impression of an ancient and vast land – the kind of place you’d expect to stumble upon a dinosaur skeleton or forgotten temple buried in the sand. The prickly cacti that dot the terrain are called xương rồng in Vietnamese, which means ‘dragon bones’. People believe that this is where dragons came to die: their ‘bones’ littered the earth which then scorched itself in grief, leading to the desert-like landscape you see today. Riding through the giant mounds of boulders and cacti – which appropriately look like tombstones – it’s easy to imagine this place as a dragons’ graveyard. As the road continues, the shrimp farms disappear, the wind picks up, sand blows across the tarmac, and kilometres of empty, tantalizing coastline comes into view. This, of course, is the real reason for the construction of the new road: Sometime in the future, fancy resorts and golf courses will probably line these beaches. But, for now, the only settlement in the area is Sơn Hai fishing village, a dusty, dry little place on the coast. Blue, wooden fishing boats and giant coracles cluster in the harbour; it’s a very scenic spot, except for the town’s trash collecting in the bay. Sơn Hai’s narrow streets appear rough and living conditions look pretty poor, but there’s a surprising amount of activity and life, especially around the market near the seafront. 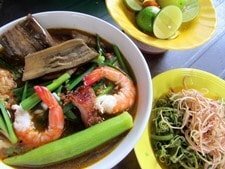 In the late afternoons – as in most Vietnamese coastal villages – there’s a pleasant buzz as kids come out of school and food vendors set up on the roadside. Get here at the right time of day and you might find yourself charmed by this rustic fishing settlement. As the road descends into the fishing port of Ca Na you’ll see the whole coastline unfurling all the way down to Lien Huong and Mui Ne beaches in the distance. A grand, new boulevard (empty, of course) leads past enormous salt flats to join Highway 1. Turn left (due south) onto the highway for Ca Na beach, where there are a handful of hotels clustered on the beach-side of the road. 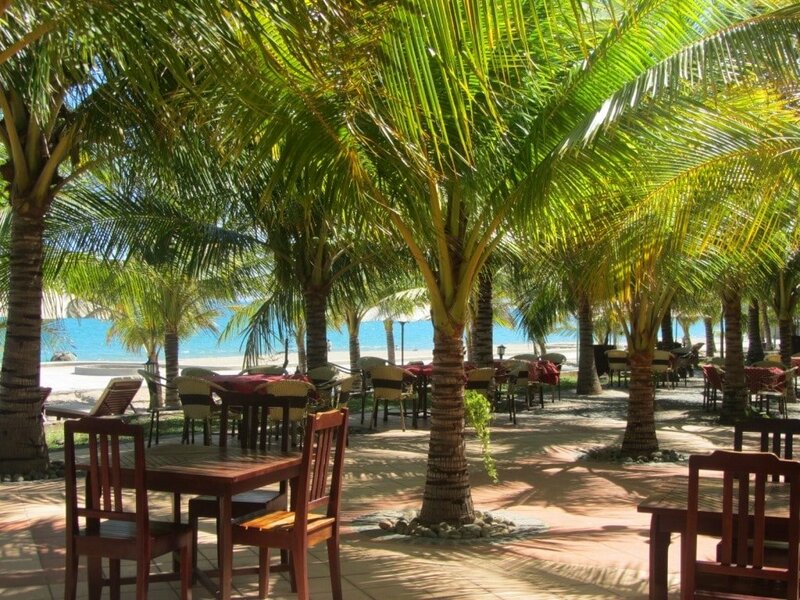 Ca Na Hotel is good value for its little seafront bungalows, or try the comfortable but pricier rooms at Hon Co Resort. There are a handful of rather overpriced seafood restaurants along the highway for dinner. If you’re not heading back to Phan Rang the next day, consider extending your road trip southeast on the new Sand Dune Highway to Mui Ne. (See Related Posts for links to more great road trips in the area). 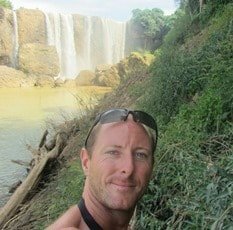 This entry was posted in ALL, Coastal, MOTORBIKE GUIDES, The South and tagged beach, Ca Na, guide, motorbike, Mui Dinh, Phan Rang, road trip, travel, Vietnam. Bookmark the permalink. thanks for all the information you put up here! This one especially has come in very useful as maps.me, my go-to offline bike map, still doesn’t list the route and I’m not sure I’d have risked it without you 🙂 It was raining earlier today when I cycled up, but still so beautiful! Stunning vistas, reminded me of Sardinia. Great to hear you enjoyed the ride, despite the rain! It’s very unseasonal – the weather has been all messed up this last 9 months or so. Great advice as always. Just did it this week. However some dragon may have just died there recently because huge boulders are blocking the road and power lines have been fell. The road is still drivable by bike though. Thanks for the update. Yes, I actually rode it a couple of weeks ago too and there were dozens of landslides due to all the unexpectedly bad weather this December. However, like you said, it was still passable for motorbikes. Hi Dan – Since I don’t do well on bikes (I’ll show you my x-rays), I’m wondering if this route can be undertaken via 4 wheel transport. Thanks, mj. Yes, the entire route is a paved 2-4 lane road so you can drive any vehicle along it. As I mention in this guide, there are occasional rockfalls which can be dangerous and have marked the road surface with several potholes. But, in general, it’s easy riding. The first development has arisen as a result of the new road through this Mad Max-esque landscape. 4km after the turn-off to Sơn Hải village [and clearly signposted at that junction] there is a new adventure sports theme park called Tanyoli [meaning “TANgo YOur LIfe”]. It is still in the early stages of construction but they have set up some ATV tracks and later this year will be hosting some dirt bike trial competitions. They have also just received all their archery equipment and the range should be up-and-running next month. There are further plans for kayaking, zipline, rockclimbing and more. There will also be a guesthouse and camping facilities – actually you could probably camp here already if you had your own tent. As per another comment above there is indeed a much easier way to get to the lighthouse. Just a few km after Tanyoli [or about 20km from Cà Ná if you are coming from the other direction] you will notice 2 huge [really, huge!] boulders at the left-hand side of the road [or right-hand side if coming from the south]. Opposite them there are a few shacks selling drinks and snacks. It is about an hour’s walk to the lighthouse from here – the first half leads you over the dunes and down to a small settlement next to the sea; the second part involves a sharp climb which at some stages is a 40 degree climb (albeit on a concrete road). Best tackled early morning or late afternoon. You can stay overnight at the lighthouse or camp if you have your own tent. The building next to the lighthouse [both of which are in excellent condition] boasts extra quarters from years gone by when the lighthouse was staffed by significantly more manpower. There is a basic shower downstairs and then there are beds but they are basically sleeping on a slab of wood so you might be advised to have a few shots if you want to get some sleep. It is a fantastic experience to stay overnight here and no better place to enjoy the sunrise. No problem to leave your motorbike and bags at the drinks stalls – just pay for parking and buy some drinks form Bà Sông as thanks! Thanks for these updates. Yes, I’ve been through the area a couple of times recently and seen the new developments – there’s a lot more to come in the future too, I’m told. Camping by the lighthouse sounds great! Your article inspired me to take a trip down there and hike up to the lighthouse. If you don’t mind, I’ll give you some updates. The best way to get to the base of the pathway is to take the new 4-lane road. At the end of the pavement (for now), there is a large boulder on the left and a small street cafe on the right. You can park your bike safely at the cafe and walk across the road and towards the hill. It’s less than a km to the path. The cafe will also keep your bike overnight if you want to camp at the lighthouse. The other news we heard is that it’s now possible to drive the new coastal road from CaNa to Mui Dinh. However, it is very rough and waiting a few months might be better. We were told the views were amazing. Excellent. Thank you, Mark. Camping at the lighthouse sounds exciting! I’ll be passing by soon. Thanks again for the updates – very useful to me and, I’m sure, to any readers too. 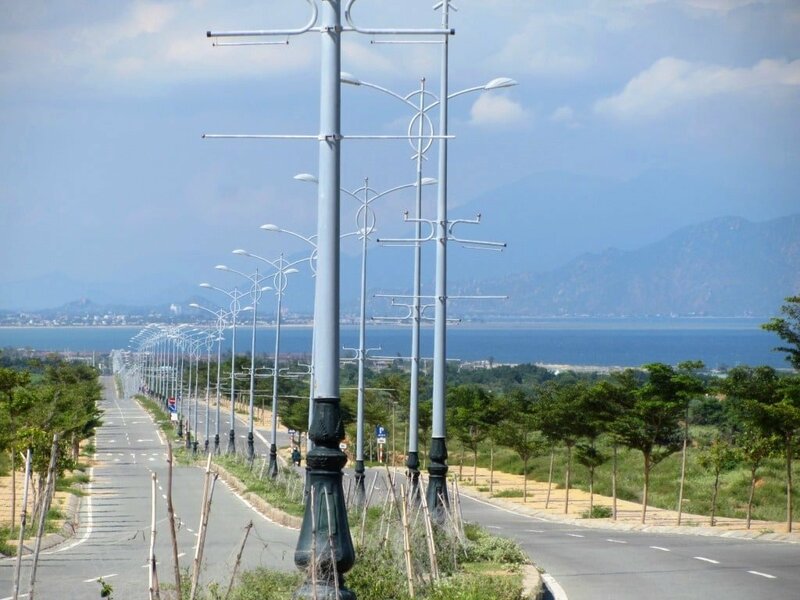 I guess you are aware of this, but that new road from Mui Dinh to Phan Rang will soon be the same as the new coastal road from Phan Rang (past Vinh Hy) to Binh Tien which you previously wrote about. Just today the new bridge on the north side of Ninh Chu Bay opened, and soon the new bridge on the south side will open as well; creating one long (116 km) continuous 4-lane coastal road from Mui Dinh (and later CaNa) to Cam Ranh. Yes, I was aware of the construction of the road to the south and north of Mui Dinh, but I wasn’t aware of the state of completion. Thanks for keeping me updated. I will be driving through there in a couple of weeks, so I’ll have the chance to see its progress then.